to find more info about my recent DXpeditions to San Andrés and Providencia in 2004 and 2006. You can also find all HKØGU logs. The San Andrés archipelago consists of three Islands and some Islets, so called cayos (cays), is located in the western Caribbean off the nicaraguan coast and belongs to Colombia. The rather flat main island San Andrés is about 7 miles long and over 2 miles wide. 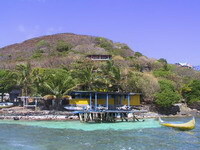 Providencia is a mountainous island of about 5 miles in diameter and is located some 50 miles north of San Andrés. The third island, Santa Catalina, is connected to Providencia with an about 300 meters long pedestrian bridge - the “Lovers Bridge” and is about 1 mile in diameter. The islands are surrounded by the third biggest coral reef in the world - an “El Dorado” for divers and snorkelers. to find our travel report and a few photographs about San Andrés and Providencia. Send your application well in advance; the mail is very unreliable. Licence fee is 7 US $ for an HKØ/Homecall licence or 70 US $ for a genuine HKØ licence. The HKØ/Homecall licence is valid for one year, the genuine HKØXYZ licence is valid for 10 years. DXpedition teams can apply for a special call sign like 5KØXYZ - this licence is valid only for the time of the DXpedition and is free of charge. Attention: Since 2008 “genuine” HKØ-licenses like HKØXY are issued only to native hams, foreign hams get now HKØ/homecall or DXpeditions-calls for teams like 5KØA or others.